Dog Boy Knives - artisan knives borne from a desire to create beautiful yet functional items from things that may otherwise end up in a rubbish heap. DBK is Richard Cooper, who is happily working his brand of creative magic during his "spare time" in a backyard studio in Brompton SA. His knives can now be found not only in the kit of some of Adelaide's best chefs but also being used by some of some of the worlds best chefs around the globe. Several prominent Adelaide restaurants also use DBK steak knives. 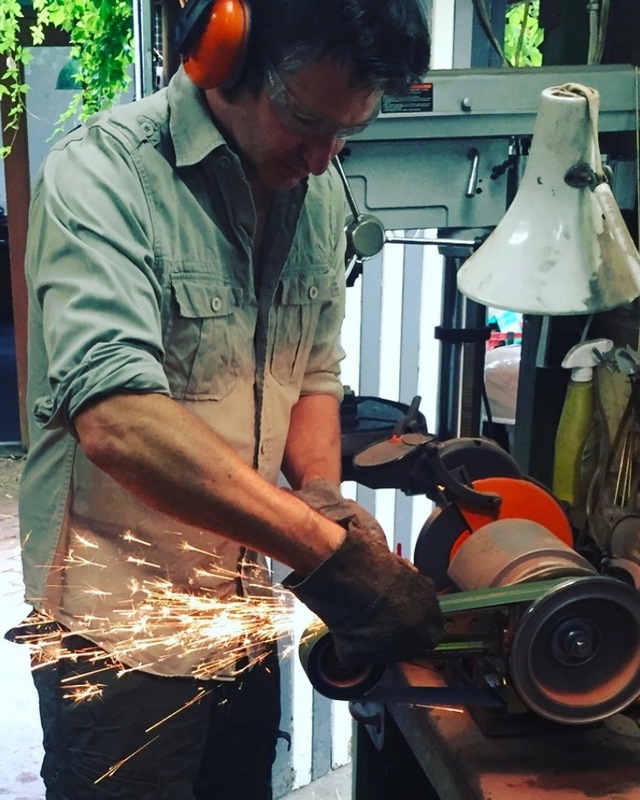 Each knife is hand forged from high carbon steel, sourced from old discarded files, saws and mower blades. High carbon steel is perfect for creating knives; it is easy to keep sharp and favoured by chefs for that reason. The different materials sourced result in the unique shape and function of each individual knife... forged by hand using traditional methods to create one-off, quirky creations. Handles are also crafted from recycled product - Australian hardwoods and small offcuts of more exotic timbers from local sawmills are fastened with brass or stainless steel pins. Being individually hand crafted, no two knives can be exactly the same making the perfect gift to a loved one or just for yourself.